The Library of Congress has a variety of apps including some great choices for virtual field trips. 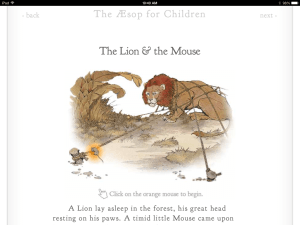 Aesop for Children is an interactive ebook app that’s makes it easy and fun for kids reading these tales for the first time or teachers sharing them with their students. This is a great app if you only have one iPad or access to a few to create reading groups. Have students retell a story with one of my favorite Common Core aligned lesson plans! This app is also available on Android devices.